in the gardens at Dahshur. “Full of fire, free of malice,” he comes prancing into view. That is what Paraskevas expects of his stallions. Ghallab is here to show us he is just that — the strong, handsome, masculine form of Arabian stallion that is ridden daily in the desert. We will see the three male families maintained at the stud: that of Ghallab traces to Gamil el Kebir through Hamdan; two trace through different Akhtal branches to El Deree. All three male lines are bred to a variety of mares, both in phenotype and strain. This is in keeping with Paraskevas’s commitment to maintaining diversity in his bloodlines and phenotypes. Note: The mares and fillies, daughters and sisters of the horses described on the following pages were featured in the May 2013 issue of Arabian Horse World. Our visit overlaps, in part, with that of noted international judge Scott Benjamin, presenting a unique opportunity to compare observations. Each horse is presented in-hand, then is set free at liberty in the arena. Finally, all those more than three years old are ridden in the arena at all three gaits. On one day, we ride out with a group of stallions into the desert and have the chance to see them in action. Hamdan — chief sire at Inshass from 1941 until the closing of the stud — and his dam Bint Radia — a queen of early RAS breeding; they formed the basic structure. 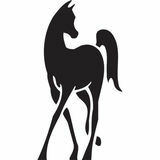 Come forward through Hamdan’s son Anter (his dam Obeya tracing to the same root mare as Bint Radia), then five more generations — Wahag, Misk, SEA Ateya, Riskallah, and now Ghallab. You will see the phenotype that stands before you. Paraskevas selected Ghallab’s grandsire SEA Ateya almost 30 years ago, and he takes very seriously the responsibility for breeding this line. “Ateya was also my riding horse,” says Paraskevas. “I have never ridden a better horse, or shall I say, I have never had a better companion and friend in the desert. This horse would not just listen to me, he would precede me in doing the right thing. ‘Inner quality’ is what he stood for, and inner quality is what we look for in his offspring, several generations down. Thankfully, he has been true. All of his male get are masculine yet gentle. Utterly Arabian in appearance and faithful to his sire line — what else can one want? I am thankful to God every day for the gift of such a male line. “Ateya was bred to Haneyat EAO, a mare with the striking influence of her grandsire Sameh, who contributes size, substance, strength, and stamina. Their son Rizkallah was bred to Shameya EAO, a Kohailan-type mare, which produced Ghallab. Ghallab has given us nine males, from a wide variety of tail female lines. Several of these are now proven stallions that are passing on what we like from Ghallab in the many different expressions made possible by differences in the tail female lines of the dams.” Ghallab, the second generation of Paraskevas’s breeding, has two more generations on the ground. The Ghallab males show broad chests, long hips, and overall balance, usually on a medium to compact frame. The heads are masculine and clearly Arabian. Cannon bones are short, and the hindquarters are correct and strong. All show beautiful tail carriage — a characteristic that is mandatory for Paraskevas. These horses are ridden daily in the desert, and it shows in the sinewy tendons and muscling. One is hard-pressed to choose among his sons for the “best” of the next generation. This perhaps explains Paraskevas’s insistence that all colts be allowed to grow up, be ridden in the desert, and then be evaluated for future use. Ghallab’s first son, Rafik el Oumr (x Rouchane EAO), is heir apparent, both by virtue of his birth order and number of foals. Paraskevas explains, “We use Rafik el Oumr to straighten out any mare that may be in need of extra harmony of proportions. He never disappoints, and despite his size and scope, he actually shortens the backs.” He is slightly narrower in the chest than his sire but with even better legs. Just as important is how he has delivered from the breeding shed. With six of his own sons to view, the overall strengths one sees are very good legs with short cannons, well let down hocks, strong stifles, arching but not overlong necks, overall balance, and exceptional quality. Habib el Agal (Rafik el Oumr x Razane EAO), a Kohailan Krush, blends sire and dam. He has a wide chest and solid legs, with a higher neck set, all strengths supplemented by his dam. He is still quite young, but promises to be the complete package at maturity. Hafeed Ghallab (Rafik el Oumr x Tabashir EAO) is maternal half brother to the lovely Robaeyet Al Khayyam featured in Arabian Horse World’s May 2013 issue. His dam has added elegance to the structure and strong quarters of his sire. Gawwad el Nile (Rafik el Oumr x Shams Kareem) shows bone and tendons like steel. He is more square than his sire, with the expected powerful quarters. Another Kohailan Krush, much is expected of him in the future. Right and below: Gawwad el Nile (Rafik el Oumr x Shams Kareem). Shaer el Nile (Rafik el Oumr x Bedaya EAO) is a bit stretchier in the neck, with complementary longer back and hip to match. His dam has contributed to the lovely neck and topline, and he moves with strength and grace from a strong hindquarters. His dam is of the Obeyan Om El Greiss strain, and this horse shows the elegant movement Paraskevas looks for from this group. Misk el Leil is by Rafik el Oumr out of the stunning bay Paraskevas-bred mare Quareat el Fingale (Gabbar x Shameya EAO ). This young colt shows a lovely high neck set from his dam with the overall look of his sire. His dam is of the Saklawiah Gidrania strain from the line of Moniet el Nefous, which Paraskevas uses to add a bit of length and elegance. The legs and structure are consistent with his brothers. He is an example of the promising colts that Paraskevas gives time to develop. One gets the impression that this colt is always thinking and has a close attachment to people. Youngest of the group is Badr el Doga (Rafik el Oumr x Wedd el Moussa), who promises to show the elegance of his dam when he matures. Misk el Leil (Rafik el Oumr x Quareat el Fingale). Returning to the sons of Ghallab we see the full brothers Ateya and Faress el Ahlam, out of the reigning queen of the farm, Ataa (SEA Ateya x Ateyat). These boys show how phenotypes can vary in full siblings — even of the same color (chestnut in this case). Ateya is the stretchier and more elegant. Longer back and neck are in balance. Faress is more square, with a wider chest that speaks of power. He is closer coupled with a deep heart girth and matching quarters. Both are powerful movers across sand and rocks. The heads are typical of the family, with wide-set eyes, huge nostrils, slight jibbah, tapering muzzle, and dryness that speaks of the desert. Full brothers Ateya, below, and Faress el Ahlam, facing page page, both sired by Ghallab and out of Ataa. Hafez el Ahd (Ghallab x Shams Kareem) is conceding nothing in the contest for heir apparent. Both Scott and I rode him. Dressage riders will want to pack this boy into a suitcase and take him home. Balance, a moderately high neck set that improves on his sire’s, strong back, great quarters, correct legs, and exceptional intelligence expressed in a kind eye. He travels absolutely straight, with a significant overstep. This young stallion has already demonstrated his ability to sire his better. His son Nasheed el Amal is even more refined. For quality, look at the black muzzle and eyes, the fine ears, the tail that is always up. The colt’s dam, Aneeda EAO, is perhaps the most elegant broodmare on the farm, and this colt shows that Hafez has added the best of his structure to the elegance of the dam. Paraskevas likes to point to this stallion as an example of what outcrossing can achieve. This page and Facing page: Quaher el Dhalam (Ghallab x Wansa SEA). Quaher el Dhalam (Ghallab x Wansa SEA) takes the prize for laid-back shoulder and a bit of stretch, with a wide chest and strong quarters that drive from the rear. He is a bit longer in the head and still growing. 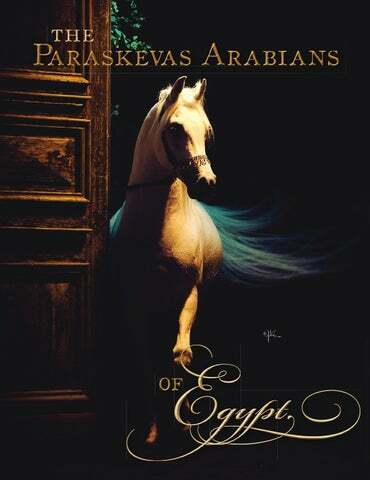 Paraskevas has bred him to several mares, including one of his few Kuhailah Rodania mares, Ana Ishta. The resulting iron grey colt Gabhet el Kamar typifies the Ghallab grandget — masculine head of strong and pleasant character, moderately high neck set, well-angled shoulder, short cannons, strong quarters, and short back. A 2013 half sister, out of Quareat el Fingale, was shown in the May issue. Left and below: Gabhet el Kamar (Quaher el Dhalam x Ana Ishta). Diwan el Arab (Ghallab x Bedaya EAO) has a shorter head than his sire or siblings and tremendous width between the eyes. His neck is the heaviest among his siblings, with a curvy body in a compact package. His first foal Qualb el Leil, out of Tahsahil EAO, shows strength with more refinement from his dam. Diwan el Arab (Ghallab x Bedaya EAO). This page and facing page: Diwan el Arab (Ghallab x Bedaya EAO). Abol Rood (Ghallab x Tabashir EAO) is one of the most elegant sons, having a lovely neck and soft eye. He lacks for nothing in the strength department, with characteristically strong hindquarters. One looks forward to seeing this boy under saddle. Taking the entire group together, the terms “balance” and “power” are consistent descriptors. Abol Rood (Ghallab x Tabashir EAO). but every bit as exceptional as the Anter family. stunning shoulders and lovely, high-set necks one can imagine. senior stallion of this line, Gabbar. This page and facing: Habib el Rooh (Khafif EAO x Rooh el Fouad EAO). On they came — five more Khafif sons and daughters — all with the same exceptional front end, natural elevation, and smooth movement. Each showed influence from their respective dams, but the structure carried strongly forward from the sire, a rare doubling of Akhtal. Again, the fine skin, black muzzle, and dark eyes spoke of exceptional quality. The heads show a more significant jibbah than the Ghallab family, while retaining a clearly masculine look. The chests were a bit narrower and the quarters a bit lighter than the Ghallab family, but the square and well-spaced hocks create a drive from behind that is exceptional. All of the horses are also slightly uphill, which contributes to the ability to elevate the fore. “While the Anter male descendants Khafif el Dhil (Khafif EAO x Cinderella SEA). issue. His dam is the most elegant senior broodmare at the farm. and hindquarters than his sire, with beautiful balance. quality. As with the Khafif branch, they benefit from a slightly uphill structure. think of him as being on par with Gabbar,” he said. This page and facing: Zay el Hawa (Gabbar x Aneeda EAO). Sahab), has the same look and structure as his sire. The gorgeous neck set, longer and elegant head to match, substance, and balance are stunning. It will be fun to see him grow up and prove whether his sire will be better in the breeding shed than Gabbar. Above and left: Sawwah (Zay el Hawa x Likaa el Sahab). The next day we head out into the desert. Riding first through the soft sand, one quickly understands why structure is a top consideration. Sound legs, strong backs, and functional necks are essential to carry the riders with balance and ease through this terrain. Clambering over bands of rocks, the barefoot horses anticipate their exercise in the desert. It is a bit of fantasy to imagine oneself riding like this 200 years ago. But the reality is that these are horses bred to go in the desert today, and hopefully, for many years in the future. And what of that future? With the significant diversity of dams, Paraskevas has a lot of choices for breeding all three groups of stallions. “We are very happy to have a variety of dam lines in our mare herd. Of course, we are always looking to acquire new mares from the EAO every time we can. The EAO auctions are a treasure trove for serious breeders and one can find the best broodmares there. We recently acquired a mare from the Riyala branch of Kuhaylah Rodania that we were longing for, and we may still add mares of the rare strains of Inshass Mabrouka and Inshass Karima (we do not have any mares from these two strains). “We are proud to show the world that the EAO bloodlines in Egypt are alive and well, without the help of any foreign-bred (and inbred) stallions. Beauty and ability to perform are not impossible to combine,” Paraskevas said. Savor these photos. Look closely at the tendons in the lower legs, the muscles of the upper forearm and stifle and gaskin, the strength of the hindquarters, the correct structure and width in the hind legs, the wide chests, the naturally dark skin around muzzle and eyes that has never been shaved or treated with oil. See the beauty of the heads with wide-set eyes and moderately convex jibbahs, showing an expression full of intelligence and affinity for people. Observe the ease with which they are ridden and the enthusiasm for work, with tails gaily carried. The characteristics that drew many of us to the Arabian are here in Dahshur. We hope to return soon. The stallions Zay el Hawa and Habib el Rooh. An in-depth look at the senior stallions and their promising sons (July 2013).